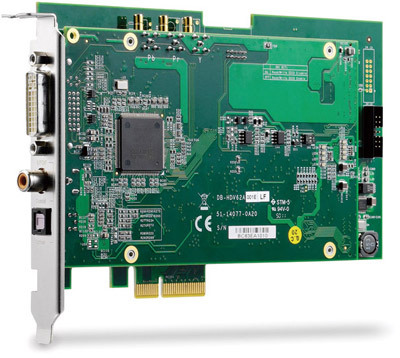 The PCIe-HDV62A high definition video and audio capture card enables single-card acquisition of full analog/digital video and digital audio signals. 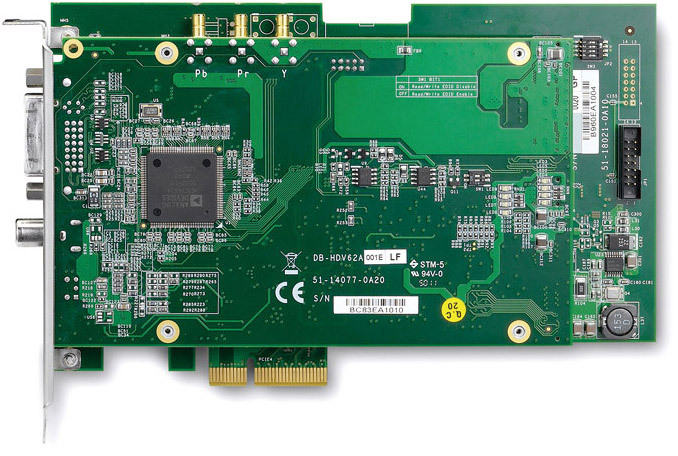 Featuring uncompressed full HD up to 1080p at 60 fps and 10-bit high-resolution ADC and HDCP support, the PCIe-HDV62A delivers serious benefits and reduced TCO for applications requiring simultaneous capture from both video and audio sources, such as multimedia device testing and medical imaging. The PCIe-HDV62A not only delivers uncompressed high-definition video data from DVI or HDMI, but also provides an analog video decoder omprehensively supporting RGB, NTSC/PAL, S-video and YPbPr, with an integrated audio decoder for HDMI and S/PDIF capture, providing a highly integrated solution. To meet current entertainment market standards, video product manufacturers must implement a full range of testing procedures, including input interface, display resolution, and color space adjustment. Automatic video testing equipment provides an economical and accurate testing environment, helping manufacturers to more quickly adapt to growing and evolving markets. 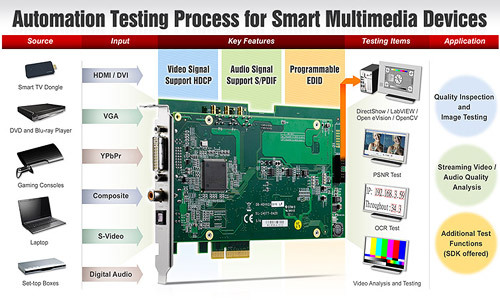 Smart multimedia video testing has grown to require support of a wide range of specifications, including EDID (extended display identification data)/DDC, HDCP (High Definition Content Protection), PSNR (peak signal to noise ratio), and OCR (optical character recognition), among others. These tests and standards ensure consistency of video transmission performance and accuracy for higher quality products. Critical factors in video testing software are user friendliness and short learning cycle, enriched API templates, support for popular third party applications, easy testing function customization, and easy user interface implementation. 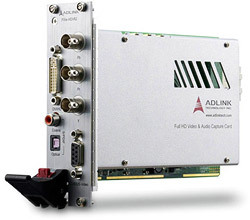 ADLINK' s PCIe-HDV62A high-resolution HDMI video/audio capture card features Full HD (1920x1080p) image support, up to 60 fps streaming data capture, integrated multi-source digital audio data capture, enriched HDMI, D-Sub, YPbPr, CVBS/SVideo, and AV terminal all-in¡Vone input interface, EDID/DDC programming and update support, HDCP digital content encryption for PSNR, and OCR for automatic image signal alignment and testing. In addition, ADLINK' s ViewCreatorPro application, included with the PCIe-HDV62A, features video and audio recording, color space conversion, and image cropping function testing through simple parameter configuration and GUI without any coding requirement. Compatibility with Microsoft' s DirectShow enables enriched support for third party software and enhanced flexibility and expandability. 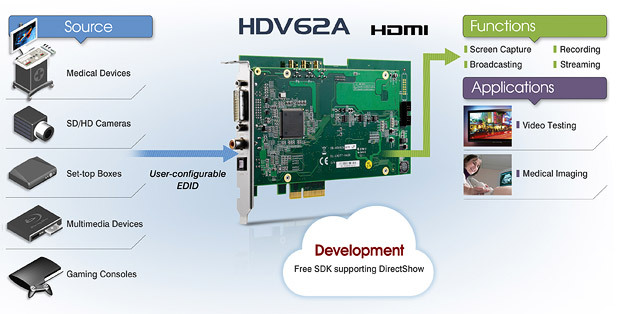 With complete hardware and software features for video/audio testing, the PCIe-HDV62A is ideal for manufacturers' video capture requirement by most commercially available multimedia devices, including smart TV streaming dongles, network streaming TV boxes, analog/digital set top boxes, Blu-ray players, KVM image quality control and VGA/HDMI image output testing from notebooks, handhelds, and tablet computers.